In the previous post we seen an Action bar that could be implemented on Honeycomb (API Level 11).But what about other other level for that a libraray called ActionBarshelock was introduced. ActionBarSherlock is a library by Jake Wharton, that enables you to use action bars even on older devices without having to code an action bar from scratch. This library deals with all the details you do not want to care about. Even Googlers like Roman Nurik (visit to see what he says here) recommend to use this library and the Google IO app also makes use of this lib. So should you! "According to Androlyzer, Whatsapp uses ActionBarSherlock for their Action Bar, which allows them to have a consistent Action Bar on all Android 2.1+ devices." Since the action bar offers many functions and is the most important navigational component. 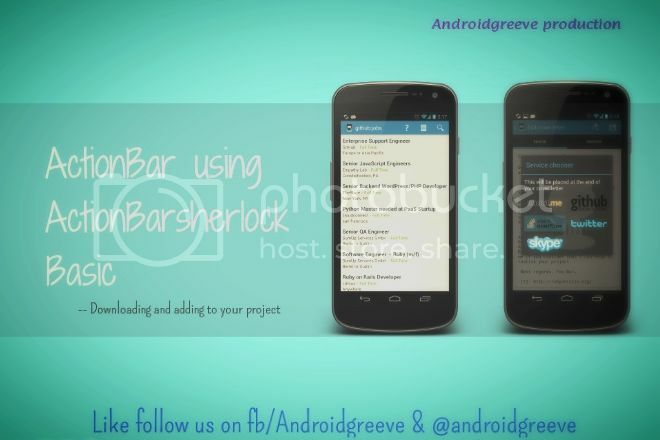 Where to get ActionBarSherlock ?How to Add ActionBarSherlock to Android sdk in eclipse? The download contains three folders: library, samples and website. The samples folder contains four sample projects to showcase what you can do and to show you how to do it. You should have a look at them. The website folder contains the code of the project website. The library folder finally contains ActionBarSherlock’s source code. Go to Eclipse and add the ABS-library as an Android project. //Do not use Eclipse’s import tool to import the ActionBarSherlock library – it would not work immediately and you would have to fix some settings. Instead use the project creation wizard of the Android Developer Tools. select the folder, which Eclipse then uses to search for projects. Click “Finish” to create the project. Eclipse will now create a new project named “library”. I prefer a more useful name, so select the project called “library” and hit F2 to rename the project. I have renamed the project in Eclipse to “ActionBarSherlock”, so all following screens will refer to this name. So this done adding the library to Eclipse. Now that ABS is a library project you have to tell your own project to use it. I will use the project of my last post for this. Go to project settings and switch to the Android tab . If necessary scroll down until you see the Library panel. Click “Add”. In the next window all available library projects will be listed. Select ActionBarSherlock and click “Ok”. Android Developer Tools do not use the name of a project to reference it, but instead point to the directory itself. And what’s even more annoying is that a symlink gets translated to its real path, which is bound to change more often than a symlink. That’s it.Your project bundles the lib from now on. Just adding the library won’t magically add an action bar to your project. Instead you have to change some of your code Android Working With ActionBarSherlock We will see how our previous Swipeable tabs can be made using ActionBarSherlock .